The choice of ideal life, let safety becomes the core of your adventure. ▶Convenience and Safety: With our bike phone holder you won't be distressed by the inconvenience and dangerous when you read the messages while riding. The bike phone holder will keeps you away from falling off the phone and breaking it while riding. No loose! no fall off! no bump! ▶ Easy installation: The bike phone holder takes you only 2 minutes to get everything done. Easy to install without any tools. ▶ Rotation design: The bicycle holder's unique spherical snap design and especially adjustable rotating ball joint designed makes you easy to rotate the angle as you want and allows 360° adjustment for you to select the best viewing angle. ▶ No scratch: Because our silicone straps add extra stability by catching corners of your phone so you needn't to worry about the unique four-edge fixed design would affect the use of button. Soft silicone bands will never scratch or damage your smart phone. Do not hurt the phone, do not hurt the handlebar. 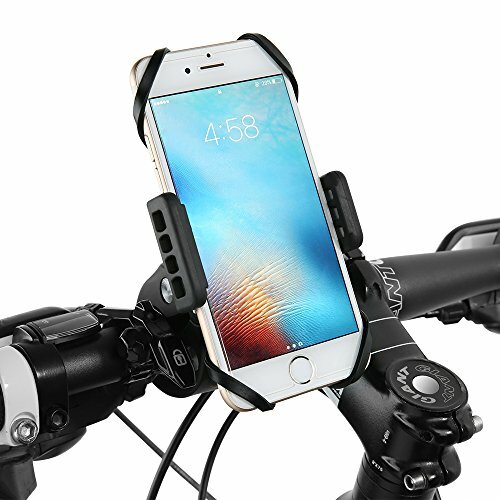 【SECURITY UPGRADE & STABILITY】Sturdy phone holder provides solid stability and four-edge fixed silicone straps catch the corners of phone to protect your phone in all directions to add extra stability to prevent you device fall out of bike. 【FRICTION REDUCTION & EASY INSTALLATION】The soft durable silicone straps net can reduce vibration as well as minimize surface scratches on the phone.Plus,the bike phone mount is very easy to install and remove. Just fix the clamp holder onto your bicycle handlebar. No tools needed. 【UNIVERSAL COMPATIBILITY】The bicycle holder clamp can be adjusted to fit any handlebar up to 1.26 inches, capable of extending up to 3.74 inches, our bike phone mount is compatible with 3.5- 5.8 inches phones, including but not limited to iPhone 7+ / 7 / 6+ / 6S / 5S / 5C / 4S, Galaxy S8 / S7 / S6 / S5 / S4, note 5 / 4 / 3 / 2, Sony HTC, etc. 【360°ROTATING DESIGN】Our bicycle holder's especially designed ball joint allows 360 degree adjustment and presents the best viewing angle for you. Also the bike phone mount won't block the screen, you will always have full phone access to your device. 【RISK-FREE PURCHASE】Don't worry about the quality of our phone holder and satisfactory customer service.If you have any problems, just contact us.Risk free purchase, we guarantee! If you have any questions about this product by siroflo, contact us by completing and submitting the form below. If you are looking for a specif part number, please include it with your message.